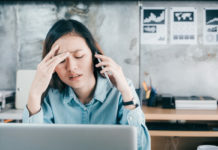 Last post we discussed cart abandonment email timing and strategies, and as promised, today we’re going to examine the content of recovery emails, using examples from the Internet Retailer 500. 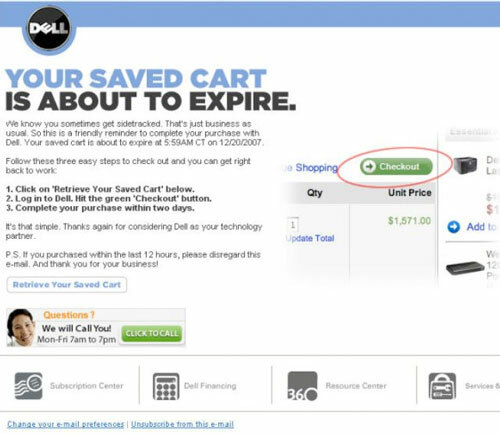 Dell also links directly to the saved cart, and offers a click to call option which can track the conversion back to the email. My only concern is the click to call button and checkout graphic are more prominent than the white “Retrieve Your Saved Cart” button. Ideally the graphic would also be linked in case the recipient assumes it’s clickable. Dell could take it to the next level by personalizing its cart recovery emails with a first name when possible, and testing short and long copy/instructions. 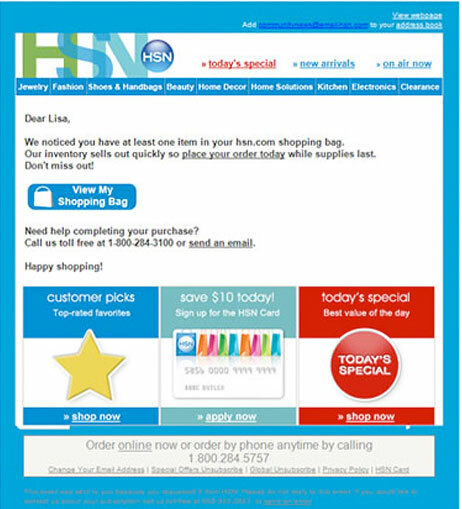 HSN also creates urgency with the line “our inventory sells out quickly” – but the email has a more company-centric tone than customer-centric. The emphasis is more on “order today” than concern for the customer – something Dell did well. Points for personalizing the message, making the call to action clear and including a phone number and email link for customer service. 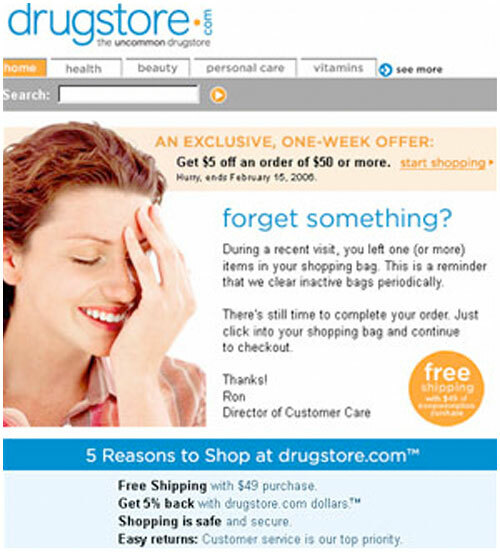 Drugstore.com creates urgency that the cart is at risk of being wiped clean, and wins points for signing off the customer service oriented copy with a personal salutation. Showing value propositions for shopping with Drugstore.com is also strong. However, the image choice should be carefully considered. The “d’oh” girl suggests the customer is doing something stupid to forget items in her cart. 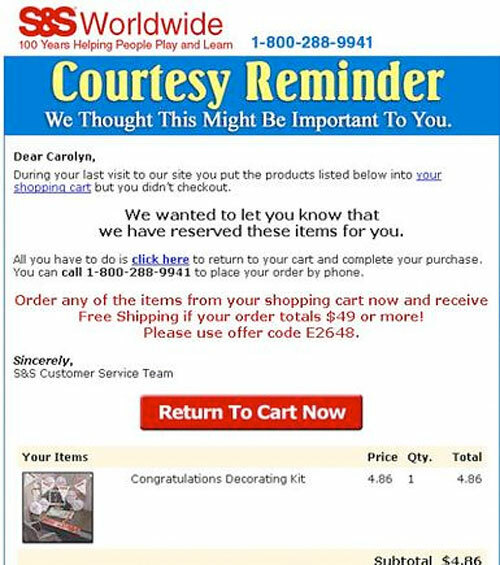 This email does not link directly to the cart, there is no call-to-action that relates to the email subject line or body. Rather, there is a banner link to “start shopping.” Also, there’s no indication of how long the items left in the cart will be held. There’s a bit too much going on in this message. S&S screams “Courtesy Reminder” in the headline, and stays consistent throughout the body. “We thought this might be important to you” sets the tone. “We have reserved these items for you” makes it sound like a special service. This approach may create a feeling of obligation for the customer – if an item is reserved, it’s not available for anyone else. One might feel guilty if they didn’t respond. The message is personalized, includes images and prices of items left in cart and is streamlined, without any distracting offers or links. 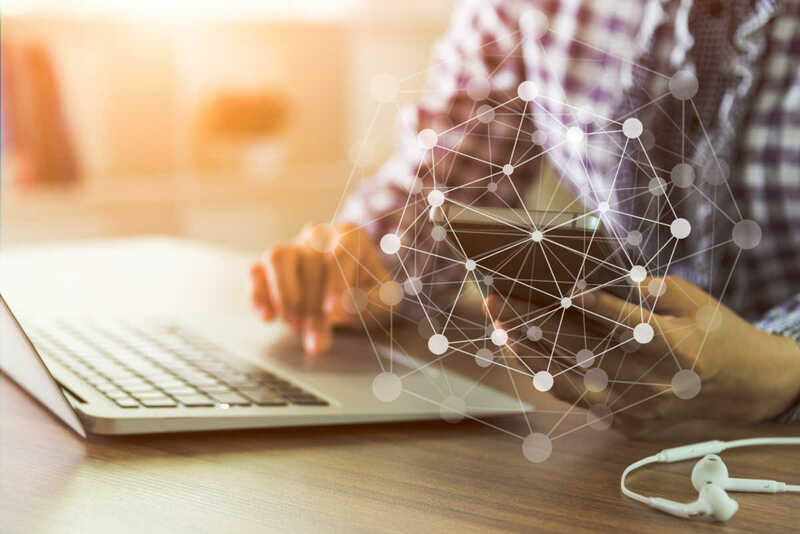 Including the offer code helps S&S track conversions from this program, even for telephone completions. 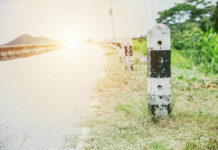 The free shipping offer also addresses the FUD (fear, uncertainty and doubt) about shipping charges – one of the top reasons for cart abandonment. Great job by S&S, I actually have nothing to critique. This program has been very successful for S&S, with a 25% conversion rate and 33% of email revenue coming from cart recovery efforts. 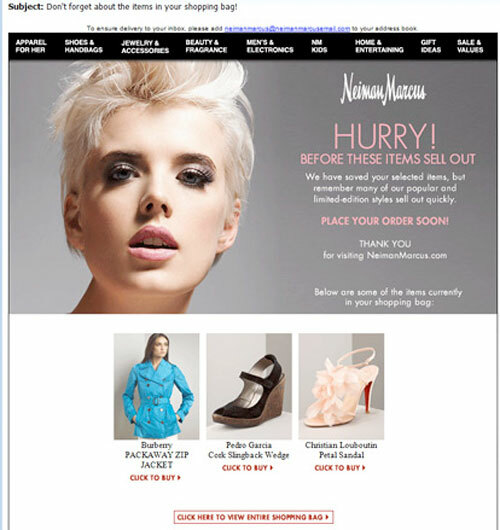 Similar to S&S, Neiman Marcus does a great job with a bold headline that creates urgency, with a customer service focus. It includes images of what’s in the cart. However, the call to action “Place your order soon” does not appear clickable (pink text) and the white rectangular button is hard to spot at the bottom. There’s also a disconnect between the image of the girl staring straight ahead and the rest of the message. You may recall from previous posts that a model’s eye gaze affects where the customer looks. 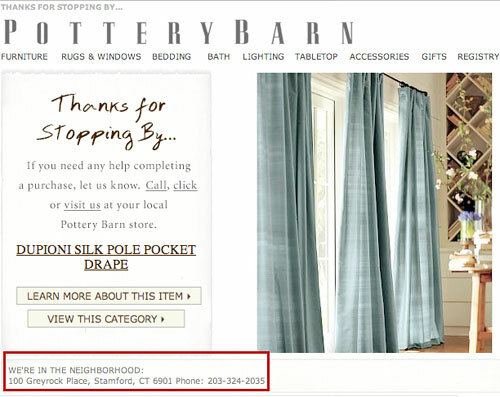 Pottery Barn smartly includes the address and phone number of the closest retail store, should the customer be researching online to purchase offline. might know this from email signup information, account info, city/state entered in checkout form or geotargeting from the cart. 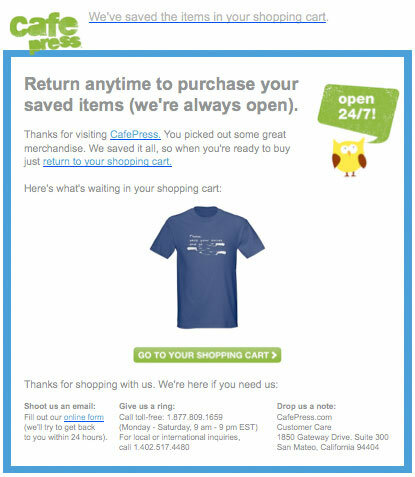 Cafe Press makes use of pre-header text “We’ve saved the items in your shopping cart” to give the recipient the gist of the email in a preview pane. 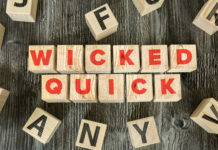 It also has a customer service tone, personalized with the item in the cart, but it’s missing price information and messaging that creates a sense of urgency. 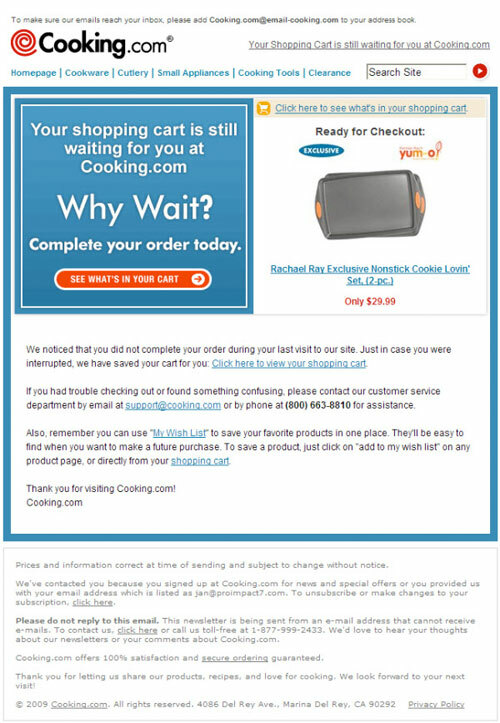 Cooking.com also does a good job in the post script, describing why the customer is receiving the message with an unsubscribe link. This would be an especially good idea for customers who have not opted in to email, but are receiving the trigger because they provided their email in the checkout process. (Though anyone who’s initiated checkout and provided an email address likely isn’t using the cart just as a wishlist). 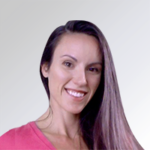 I’m not crazy about “Why wait?” – it sounds like marketing fluff. 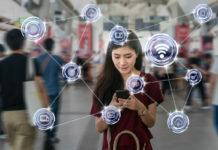 Rather, something that would create a sense of urgency like “your cart is about to expire” or “items in your cart are at risk of selling out” would be more persuasive. Walgreens gets gold stars for personalization (first and last name), repeated calls to action (both a big shiny red button and a text link) and evoking curiosity with the text “some of the items in your Shopping Cart or Saved Items list are eligible for additional discounts.” Notifying a customer when an item in the cart has decreased in price, is about to sell out or is about to increase in price is a great idea. My only critique is this email is busy – there are so many links competing for attention. Only about 15% of the page is dedicated to the real purpose of the email – the rest is navigation and secondary calls to action. 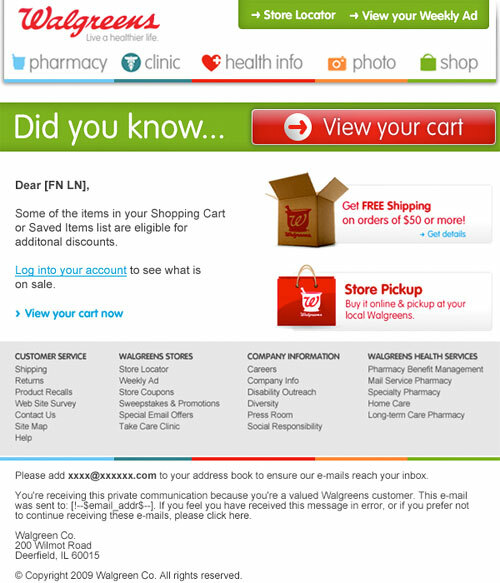 Walgreens could test a more streamlined version vs this control, or work on pulling the actual cart contents into the email like Neiman Marcus and others do. Offering incentives to complete checkout is territory you should tread carefully. 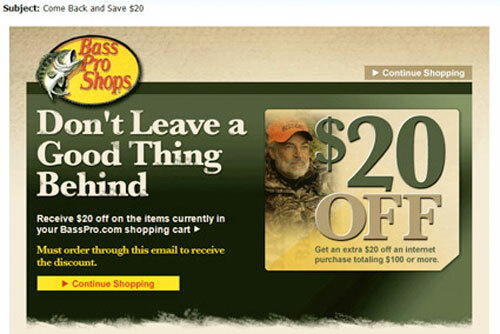 Bass Pro offers a whopping $20 reward for cart abandonment (on orders over $100) – this may condition customers to simply abandon carts to get a discount every time. However, this strategy warrants testing because it may be a more profitable strategy (more incentive, higher average order value) than a reminder without an incentive. The subject line “Come back and save $20” should also be tested, as it’s not explicit that this is a message regarding an abandoned cart. 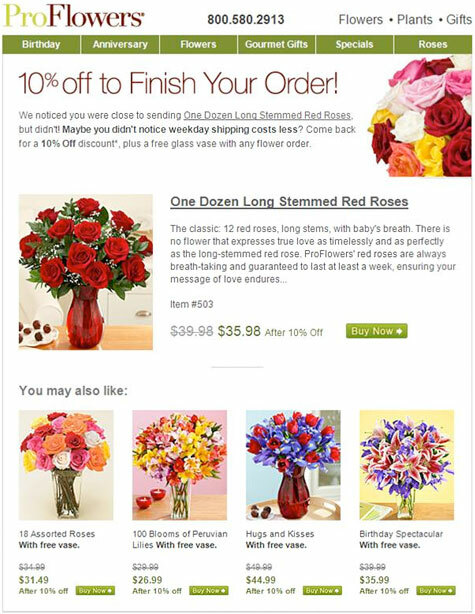 Proflowers also plays the discount card, offering 10% off an order. Including “Maybe you didn’t notice weekday shipping costs less” adds additional incentive to click through (ideally such an email would be sent early in the work week). I imagine emails for flowers should be sent as quickly after the abandonment as possible as they are usually ordered very close to the event. I like how Proflowers merchandises its recovery email. The item that was abandoned includes a large image, full description and price after discount, along with alternative product suggestions. 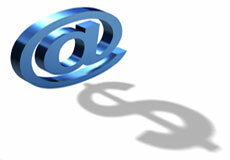 Craft a subject line that makes it clear the email is about items remaining in the cart. Make use of pre-header text. Again, make it clear the email is about items remaining in the cart. (Don’t put shipping offers, generic copy or unsubscribe links up there). Don’t be salesy. Keep your copy friendly, customer-centric and customer service oriented. Bonus points for creating a sense of urgency (cart will expire, product is about to sell out, price has dropped, etc). Include contact information for phone and email (click to call if you offer it). Personalize with name and if possible, show which items are in the cart along with current price information. Link directly to the cart. Tell your customer when his / her cart will expire (if relevant). Include store value propositions, but don’t let them overshadow your main calls to action. Test product recommendations. They may be effective, they may also be too distracting, create “choice paralysis” or make your email too salesy. Avoid superfluous navigation, links and calls to action (don’t clutter your page). Consider the emotional impact of images (like the woman smacking her forehead). 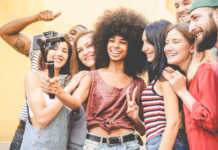 A quick and cheap way to gauge customer sentiment is to submit your images to 5 Second Test, which will expose them to users who will provide feedback on the impression they give. 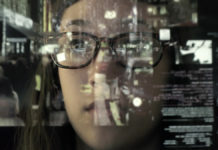 Explain why the customer is receiving the email (post-script is fine), and include an opt-out link if you plan on running a series of triggered emails. Use caution with discounts and other offers – they may teach the customer to abandon every time. Some experts suggest sending incentives in a 3rd or 4th email (if you’re sending a series) to win non-responders.